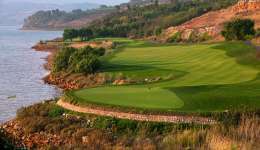 Located a short distance from Kunming, the ancient capital of Yunnan Province in Southern China, the Spring City Golf & Lake Resort was built on a mountainside almost 7,000 feet above sea level and overlooking the beautiful Yang Zong Hai Lake. With an ideal year-round climate for golf and grass growing, the resort enjoys tranquil views across the still waters of the lake to the surrounding mountain range. The setting is not dissimilar to that of Scotland’s famous Loch Lomond club, the golf also with a distinct American flavor. Since opening in the late 1990s Spring City has won virtually every accolade available to the modern Chinese golf course. 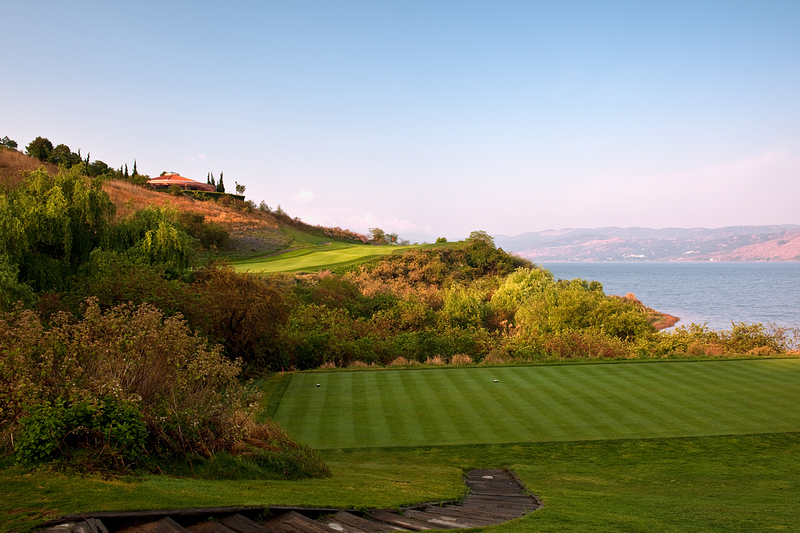 Part of its appeal lies in the lakeside serenity and part in the pampering golfers receive when playing here. The bentgrass tees, fairways and greens are almost always impeccably maintained. The more impressive of the resort’s two courses is the Robert Trent Jones Jr. designed Lake Course, which is laid out beneath the elevated clubhouse and drops down the hillside toward the water. The design team shifted more than 4.5 million cubic yards of earth, primarily rock, to construct the course with most holes built on ledges and terraced down toward the lake. Lined by thick native grasses the course is severe on stray balls and par is well protected by some extreme driving challenges, a lengthy scorecard and a number of heavily contoured greens. Hardly an ideal start, the opening tee shot is fairly typical of what to expect throughout the round, a dramatic plunging drive to a narrow fairway with an instant reload for those missing on either side. Although the rest of the opening stretch is similarly penal, there is no denying the adventurous quality of par fours like the 2nd and 3rd or the beauty of the strong downhill par three 4th. The 5th and 6th are also interesting, for the options created by a split-level fairway on the 5th and a solitary central fairway bunker on the 6th. Both greens are more difficult to approach from the fat side of the fairway. The first real glamour hole is the mid-length 7th, which tumbles toward the lake and is fun for those who can find its angled, falling fairway from the tee. The next three holes lie partly within the lake. The short 8th drops around 100 feet to a green backing onto the water. Back pin locations here are especially demanding as the penalty for missing long on this hole is absolute. Following the 8th comes a beautiful par five right along the lake’s edge, which is reachable in length but sadly not in design as the neck of the green pinches in so tight that only the super-strong or the desperate would dare take it on. Even more memorable is the intimidating par three 10th, played from a lakeside tee over part of the hazard and up a steep ridge. Requiring at least your longest iron, anything short or right will crash down the cliff and into the water. Of the remaining back nine holes the beautifully sited 11th and 13th greens, with their lake backdrops, are a standout, as is the all-carry par three 14th and par four 18th. Despite moments of extravagance and the occasional penal element, the impeccably maintained Lake Course at Spring City is terrific fun, well constructed and home to some of the most pleasant golfing views in China.